The Ourania area serves as part and property of the Zamorak Magical Institute, or ZMI. At first they are very secretive of their business, but depending on where you go, you will survive. 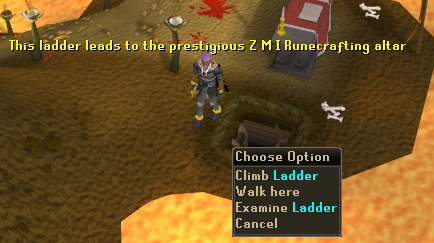 This place is used mostly for the ZMI Runecrafting altar found in the Ourania Cave. The altar was built by the Moon Clan who searched for new places to craft runes. The ZMI altar was among the newly discovered. The Zamorakians who guard this small mountain are not easily going to give it up, but will allow you to wander around and use its benefits. There are a number of ways to get here. Taking a Spirit Tree to the Battlefield of Khazard location. The tree is located just northeast of the Battlefield which is northeast of the mountain. If you have completed the Lunar Diplomacy quest, you may use the Ourania Teleport at level 71 Magic. You have to speak to Baba Yaga in her interesting house with chicken feet north of the bank on Lunar Isle before you can use it. You must also be on the Lunar Spellbook. It requires two Astral, one Law, and six Earth runes to use. This is the fastest way. If you have a Ring of Duelling, you can teleport to the Castle Wars Arena, and then walk straight north past the Observatory. 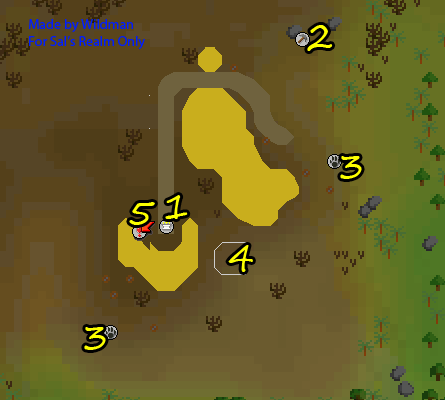 If you have unlocked the use of Fairy Rings, you may teleport to Fairy Ring Code: CIQ and walk north past the Tree Gnome Village to the river, then cross the bridge and walk west. Charter ships are also an option. Just pay the fee to Port Khazard and walk west over the Tree Gnome Village until you've reached the river, then cross and continue west to the mountain. 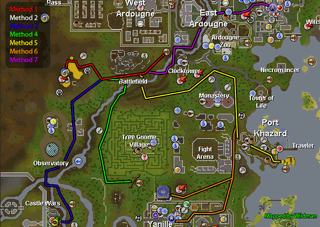 A teleport to Yanille will work just as well, as well as a teleport to your house if it is located in Yanille. You must have completed the Watchtower Quest for a Yanille teleport and have two Law and two Earth runes in your inventory. Level 50 Construction is a requirement to have your house in Yanille. One Earth, one Law, and one Air rune are required for the Teleport to House spell. If you have completed the Plague City quest and have at least level 51 Magic, you may use the Teleport to Ardougne spell. It requires two Law, and two Water runes. From the teleport zone, walk west until you've crossed the bridge leading to the castle northwest of the zoo. Now, head south and follow that road out of the city to the west. You should now be south of the city and near a spirit tree. Walk a bit more to your southwest until you've reached the mountain. 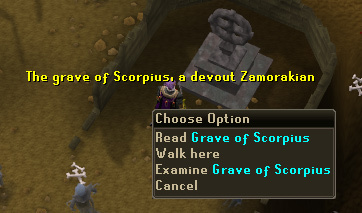 This is an altar to the god of chaos, Zamorak. After all, what's a Zamorakian temple without an altar to his glory? Here you can recharge your Prayer points, just like any other altar. This rocky outcrop is a place for you to mine Copper. Hardly anyone uses it because of the low amount of experience it gives and the fact that there is no bank there. However, if you are a lower level in Mining and would like to power mine, which requires dropping the ores, this is a pretty great place to get it done. 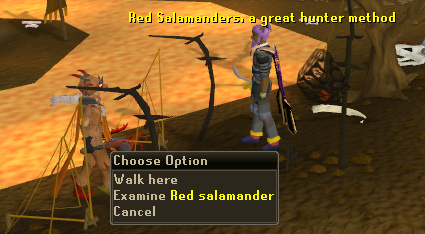 Here you will find Red Salamanders to hunt using net traps. Refer to the Hunter guide for more information on how to catch these little lizards. The Shrine of Scorpius is a gravestone upon a hill south of the ZMI Altar entrance. Scorpius is a Zamorakian follower. If you talk to him, you will not need a Ghostspeak amulet. He will give you an Unholy Symbol mould, as well as blessing any symbols you have on you. You must have completed the Observatory Quest for him to talk to you. He will only talk to players who have "Seen beyond the stars". Last but not least, the main attraction of this area. 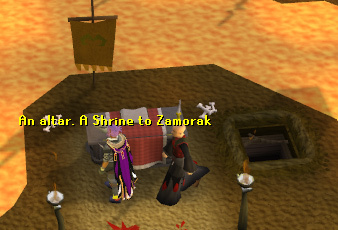 Also known as the Zamorak Magical Institute or ZMI altar, the Ourania cave is a passageway to the Ourania Runecrafting altar. At the Ourania altar, you are able to craft every type of non-combination rune without the need of a talisman or tiara. There is a banker named "Eniola", who will let you use the bank for 20 runes of any type per use. Scorpius will only talk to players who have completed the Observatory quest. He was a devout Zamorakian and will bless any unblessed symbols you may have. He will also give you an unholy symbol mould. If you talk to him, you will ask about the ladder and trapdoor near the altar. He will mostly cover up the Runecrafting project going on underground. When you ask if you are allowed to take a look, he will give you permission.